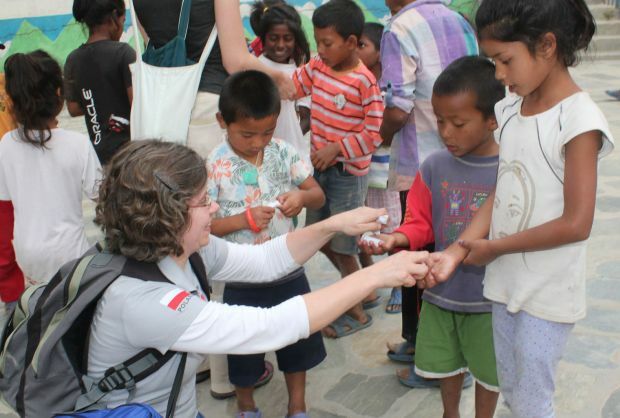 Marta Titaniec, projects coordinator of Caritas Poland, distributes sweets to inmates of the Childrens Home for prisoners children at Sankhu village outside Kathmandu, Nepal, May 7. Caritas Poland has brought a Polish air force plane with 16 tons of relief material for the victims of the April 25 Nepal earthquake. (CNS photo/Anto Akkara). KATHMANDU, Nepal (CNS) — Anam Tamang was excited: A truck of earthquake relief supplies had finally arrived at Caritas Nepal headquarters in Kathmandu. That was late May 6. By May 8, she was frustrated: 16 tons of relief material flown in by Caritas Poland had already been dispatched in small trucks to distant centers where local Caritas coordinators eagerly awaited supplies to reach to people in remote areas of the Himalayan nation. “The stores are virtually again empty,” Tamang told Catholic News Service. Manindra Malla, program manager of Caritas Nepal, conceded there were logistical issues in getting aid to victims of the April 25 earthquake. “We are running short of (relief) material and it is not easy to get things here as quickly as we want,” Malla told CNS. On May 7, the Nepal Red Cross put the death toll at more than 8,400; the government said nearly 400,000 houses have been fully or partially damaged in the magnitude-7.8 quake. Media have been abuzz with reports that relief supplies were yet to reach hundreds of thousands of victims. “We were excited to come here with the relief items. But, things are not moving fast,” Marta Titaniec, projects coordinator of Caritas Poland, told CNS May 7 while carrying relief supplies to Sankhu, 13 miles outside of Kathmandu, where more than 100 perished. “Our problems started even before we reached here,” said Titaniec, who arrived in Kathmandu in a Polish air force plane with 16 tons of relief material worth $150,000. Caritas Poland purchased supplies like blankets and tent kits for the quake victims. Like many other relief supply planes, the Polish plane had to stop in New Delhi for more than a day as the congested Kathmandu airport — 80 minutes of flying time from the Indian capital — was unable to handle the heavy rush of relief planes. “We got the relief material only on the third day after the flight landed,” Edyta Stepczak, a Polish journalist assisting the two-member Caritas Poland staff, told CNS. “This is nothing new. We have been reading about it for days. It is not going to change soon,” said Stepczak, who has been living in Nepal for four years to research the resilience of Nepalese women. Caritas Singapore wanted to send relief supplies worth $50,000 and was asked to pay $32,000 as flight courier charges. Malla said Caritas had ordered temporary shelter materials but was not expecting the supplies to arrive until the following week — nearly three weeks after the quake. Supplies in Indian cities around landlocked Nepal had been exhausted. “Now consignments have to come from cities like Mumbai and Delhi by road. We have to be patient,” Malla added. “Obviously, there is still a great deal of need, and getting supplies in is difficult,” Jennifer Hardy, Catholic Relief Services’ regional information officer for Asia, told CNS from Gorkha, where CRS was coordinating relief distribution. CRS had sent 20 large truckloads of supplies to the area. 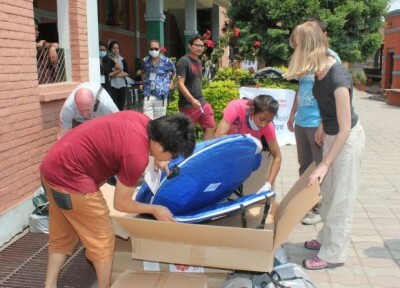 “We are distributing items as fast as Kathmandu or Delhi can send them,” Hardy added. Half a dozen parishioners of the Society of St. Vincent De Paul of Assumption Parish in Lalitpur had to go empty-handed May 7 to a remote village. “I told them to carry cash only as we cannot go there with food items for our families alone. All are suffering,” said Father Ignatius Rai, the parish priest. “Their faith is amazing. They put up a tent quickly when I went there (May 5) so that we could celebrate Mass,” Father Rai said. I am frustrated trying to determine which organization assisting in Nepal really needs donations, and whether they can be used effectively at this time given the bottlenecks that appear in the distribution network.